Would your research benefit from access to historical medical records? 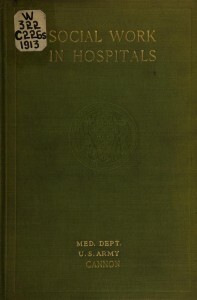 As part of a joint effort to develop best practices for enabling access to special collections containing protected health information (PHI) and other types of access-protected (“restricted”) records, the Center for the History of Medicine, Francis A. Countway Library of Medicine, and the Alan Mason Chesney Medical Archives of the Johns Hopkins Medical Institutions are conducting a survey to determine what information researchers need in order to decide whether or not to pursue access to restricted health records, such as medical records, psychiatric/mental health records, and photographs taken as part of medical treatments. The survey is being administered as part of grant work funded by a Cataloging Hidden Special Collections and Archives grant from The Andrew W. Mellon Foundation through a program administered by the Council on Library Resources (CLIR) to increase access to critical resources currently unavailable to historical research. The grant, Private Practices, Public Health: Privacy-Aware Processing to Maximize Access to Health Collections, was proposed on behalf of the Medical Heritage Library (MHL), and will allow the Center and its partner, the Chesney Medical Archives, Johns Hopkins Medical Institutions, both MHL principal contributors, to open currently inaccessible public health collections to researchers while developing best practices for enabling access to special collections containing protected health information and other types of restricted records. 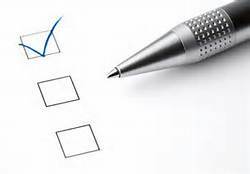 The findings of this survey will be reported at a 2014 American Association for the History of Medicine (AAHM) annual meeting lunch session and as part of a session at the 2014 annual meeting of the Society of American Archivists (SAA). By responding, you are helping libraries and archives improve how they describe records and make hidden collections available to researchers in more useful ways. For more information about the survey, contact Emily R. Novak Gustainis. In celebration of Open Access Week 2013, the Center for the History of Medicine participated in Open Access to Mass History, joining other special collections at Harvard and beyond by serving as a host site for a Wikipedia Edit-a-thon on Tuesday, October 22 at Countway Library. 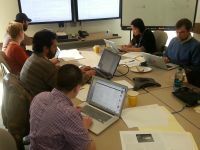 Volunteers from Boston University’s Alumni Medical Library, Children’s Hospital Boston, Dyer Memorial Library, Harvard Medical School’s Systems Biology Department, the New England Journal of Medicine, and Simmons College, worked collectively to author and revise ten new Wikipedia entries; developer and Wiki-enthusiast Adam Hyland of Boucoup LLC provided Wikipedia training and guidance. Wiki entries created and revised include those for the: Harvard Dental Museum; Richard Hodges; J.B.S. Jackson; the Medical Heritage Library, William Fiske Whitney; and the Warren Anatomical Museum. Articles pending publication include those for the Boston Phrenological Society, the Boston Society for Medical Improvement, the Center for the History of Medicine, and Richard Pearson Strong. Houghton Library recently released a video tutorial on proper techniques for patrons when handling bound, unbound, and oversize items in Harvard special collections. On March 15, 2011, the Center for the History of Medicine, Countway Library, launched a comprehensive condition assessment survey of its audiovisual holdings under the leadership of the Weissman Preservation Center, the first of its kind in the Center’s history. Through the financial support of Weissman’s Adler Preservation Fund, Weissman is conducting a systematic assessment of AV materials in special collections at Harvard. Weissman’s Program Officer for Audiovisual Materials Elizabeth Walters (pictured) is conducting the Center’s on-site evaluation and has already surveyed over 600 items from both processed and unprocessed collections, revealing audiovisual materials previously hidden to Center staff. Weissman's Program Officer for Audiovisual Materials Elizabeth Walters working at the Center for the History of Medicine, Countway Library. The initiative utilizes a web-based application developed by Weissman called SAVE (Support for Audiovisual Evaluation) that enables the collection and aggregation of item-level condition assessment data for AV materials that unites physical characteristics and condition data with curatorial information related to an item’s research value. In combination, this information can be used to identify items that are at greatest risk due to format obsolescence and physical condition, and to establish priorities for appropriate preservation actions. The Center joins fellow special collections repositories at Harvard in the survey, including the Harvard University Archives and the Historical and Special Collections Department of the Harvard Law School Library. I spent May 16 & 17 talking with computer scientists, faculty, and other archivists about the potential application of technology to archival description. The venue was a Radcliffe Institute-sponsored workshop, “Technology and Archival Processing,” organized by Marilyn Dunn and Barbara Grosz, respectively the Executive Director of the Schlesinger Library on the History of Women in America and the Institute’s Dean. Over the course of the two-day event, participants– who included Clifford Lynch (Coalition for Networked Information), representatives of OCLC, Microsoft, Google, and the Internet Archive, Jeffrey Schnapp (Harvard’s metaLAB), Stuart Shieber (DASH, Harvard’s open access repository), and archivists from MIT, Tufts, the Kennedy Presidential Library, and Harvard repositories, and many others– discussed the uses of technology to improve discovery and access by users and to increase the speed with which collections described, preserved, and opened for research. Participants found these issues to be intertwined and discussions ranged across topics with some recurring themes. As an archivist with a deep commitment to access, I can’t imagine a more productive or interesting way to spend two days. “First you must recognize when you are bored,” admonished Chung-chieh Shan (Rutgers), indicating that it is the archivists’ responsibility to identify tasks that are better executed by machines. Repetitive intellectual tasks, such as recognizing patterns of numbers or letters, matching, searching databases, and so on, can be more effectively accomplished by computers, leaving the more demanding problems that require assessment, judgment, or interpretation, to humans. Archivists were pleased to learn of existing tools, currently used in data archives and other data-intensive environments that might be applied—and surprised at how rapidly engineers understood archival practice and pointed to process elements that computers cannot address—the “squishy human bits” like relationships with donors, policy development, and institutional culture—and collection “problem children” that require extensive human judgment and handling. – ‘Single stream’ accessioning and processing of born digital collections, now being explored by some repositories, may influence workflow in paper-based collections. Is single stream processing and scanning in our future? – In addition to re-thinking the archival role, we need to find new ways to leverage the interest and skills of scholars. Traditionally, archivists have had a symbiotic relationship with scholars, alerting scholars to collections of potential interest and learning from scholars’ use of collections. Can technology enable deeper collaborations? – On the topic of users, digitized and born digital collections will change the user experience; how will we present these collections, where, to what audiences, and with what tools? Attendees pledged to consider how to continue this useful dialog and plan for next steps. The Center is already engaged in some related projects; I am looking forward to more opportunities for discussion and collaboration. 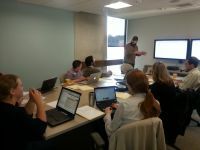 For a non-archivist’s take on the workshop, see Jon Kolko’s blog. A recent Wellcome Library blog post made us wonder about the relative popularity of our collections. What collections are drawing the most attention now? Has that changed since the increase in our online finding aids? What other factors might be at play? We examined user records for 2009-2010 and found that use of rare books is declining, possibly due to the number of digital books now available through the Medical Heritage Library and other projects. Use of archives and manuscripts is up — specifically, for those collections that have online guides, and even more specifically, for those collections that were recently opened to research. No surprises here. So, who won the contest? John Rock, co-inventor, with Gregory Pincus, of the birth control pill– the fiftieth anniversary of which, not coincidently, occurred in 2010. 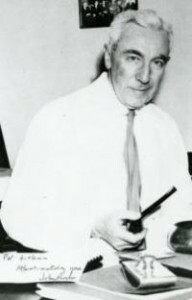 Rock’s professional records (guide posted in 2007) were generated largely from his research activities and thus were useful to researchers seeking to learn more about his innovative work. His personal papers were donated by his family in 2009. It has been a busy couple of years for the collection and for related reproductive rights and health collections; the second and third most-used collections last year were created by Alan Guttmacher (guide posted in 2005), pediatrician and early leader in International Planned Parenthood, and Robert Latou Dickinson (guide revised in in 2009) founder of the National Committee on Maternal Health and a sometime ally, sometime competitor of Margaret Sanger. What are your predictions for this year? You might want to peruse the list of online guides before you comment! After nearly three years of collaborative efforts, the Center’s collection of Salpêtrière Hospital (Paris, France) records is open and available for research. We anticipate high research interest in this important new resource; within weeks of its opening, the collection was the subject of two fellowship proposals. The collection includes .5 cubic feet of notes, lectures, case histories, and pen drawings created by neurologist and psychologist J. M. (Jean Martin) Charcot and Salpêtrière Hospital staff between 1859 and 1893. The bulk of the collection consists of 16,800 glass plate negatives, original negative enclosures, photographic indices, and a small number of prints produced by the Photographic Service of the Salpêtrière Hospital between 1880 and 1942, the bulk of which date between 1900 and 1919. Charcot established the Photographic Service in 1878 for the purpose of patient care, the study of disease, and medical instruction. Images depict whole body images of patients and heath care workers, partial body images illustrating specific medical conditions and tissue and lesions discovered during autopsy, and wards and hospital buildings. A finding aid provides item level description, often including diagnosis and treating physician. Images created prior to 1900 are openly available; contact the Center for information regarding access to restricted images. Records were given to the Countway Library in 1972 when the Salpêtrière Hospital building housing Charcot’s former laboratory was demolished. The collection remained closed to research due to preservation concerns until the Weissman Preservation Center, as a part of its Mellon-funded project to improve the condition of Harvard’s photographic collections, provided the expertise and technical staff needed to assess and rehouse the glass plate negatives. Recognizing the research value of the collection, the Boston Medical Library contributed funding for re-housing supplies. Transcription of the collections’ indices was supported by generous donors to the Center’s Discovery Fund. The Center for the History of Medicine has digitized nearly 400 works on the subjects of surgery and the treatment of wounds and injuries as part of our ongoing contributions to the Medical Heritage Library. Two titles of note, both from the Boston Medical Library collection, recently passed through the scanning lab: Addinell Hewson’s 1872 work, Earth as a topical application in surgery, and Thomas Gale’s Certaine workes of chirurgerie (1563). The arm of a patient 15 days after Hewson amputated his hand. Hewson, a once noted Philadelphia surgeon, describes in detail his practice of using powdered clay both to pack infected wounds and as a topical, post-surgical application. The idea that introducing “earth” to open wounds might have presented any medical benefit was at odds with what were at the time new and increasingly widely accepted ideas about antiseptics. Interestingly, the successes in accelerating the healing process that he describes in the book have been attributed by at least one modern researcher to the probable presence of naturally-occurring antibacterial agents in the clay that would have been unknown to Hewson at the time, and which preceded breakthroughs in modern antibiotics by nearly 75 years. Another noteworthy feature of Earth as a topical application is that it contains a striking series of woodburytypes depicting the post-operative state of four patients who Hewson treated. Viewable on pages 45, 51, 112, and 164, these portraits render his patients in an unusually stark and artistic light. The wound man illustration from Gale's work on surgery. The second title of note, Gale’s Certaine workes of chirurgerie, is the first printed book on surgery known to have been both written and published in English, a fact that sets it apart from the many English translations of foreign-language surgical texts from that era. It is a strange and whimsical work, composed in the form of a free-flowing conversation in which Gale discusses various maladies and their most suitable treatments with John Yates and John Feilde. In the course of the dialogues, Gale expounds upon various types of fractures (classifying them at times by their resemblances to the stalks of certain plants and vegetables), provides detailed instructions on the preparation of medicinal salves and unguents, and gives historical perspectives on then-current medical treatments. A surgeon in the army of Henry VIII, Gale had first-hand knowledge of the traumatic injuries associated with 16th century warfare. Pictured at right, the title page of Certaine workes contains a commonly used thematic illustration that is generally referred to as “wound man.” Serving as a grim reminder of the perils that once faced soldiers of the late medieval and early modern eras, wound man was used in many early medical texts to depict the array of battlefield injuries common at that time. This version of wound man suffers simultaneous arrow-piercings, bones smashed by clubs, truncheons, hammers, and cannon balls; flesh rended by sword slashes and spear wounds, as well as various other grievous and unpleasant injuries.